This is one of those products that has really grown on me. The day after I ordered it online I tried my mother's Dermalogica Sport SPF50 and loved it and wished I'd bought that instead. So poor old Heliocare was already playing catch-up before it had even arrived. I'd also bought it on the spur of the moment, possibly after some wine (come on I'm not the only one), and I thought it was a tinted moisturiser. It's not. It looks like it is when you squeeze it out but it just sort of blurs some imperfections without giving any colour. I grudgingly took it on holiday to Mallorca, I needed something that fitted in my hand luggage, wouldn't get confiscated and would work with just concealer if I wanted it to. 4 days later and I was converted! I really love this now and it's a recurring feature in my Bespoke Beauty Boxes I make for my clients. 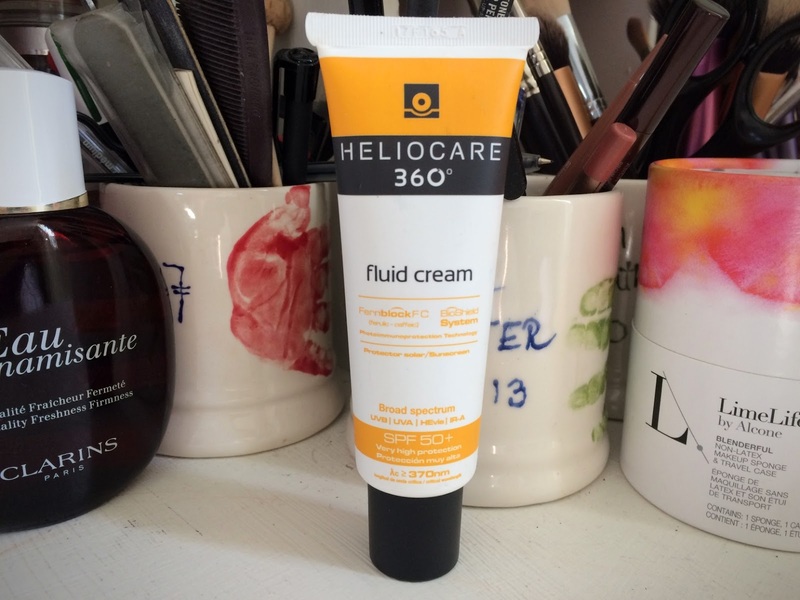 It isn't drying, doesn't affect my sensitivity and works well under and over make-up. Doesn't block your pores, and is quickly absorbed. It contains antioxidants - Vitamins C, E and green tea - which help the skin fight free-radicals caused by the sun. There's an oil-free finish for those who have an oily skin or who want a more matte finish. One thing I hear a lot of is 'SPF 50 isn't that different from SPF30' - well in some cases no it isn't. But from what I know about UVA and UVB I'm going to put the highest, broadest spectrum on my face that I can. And that's all I have to say about that. If there is a downside to this the smell isn't fantastic. It's a little reminiscent of bananas. But as someone who hates bananas I can tell you that you get over that pretty quickly. Available from Face the Future, Beauty & the Boutique.